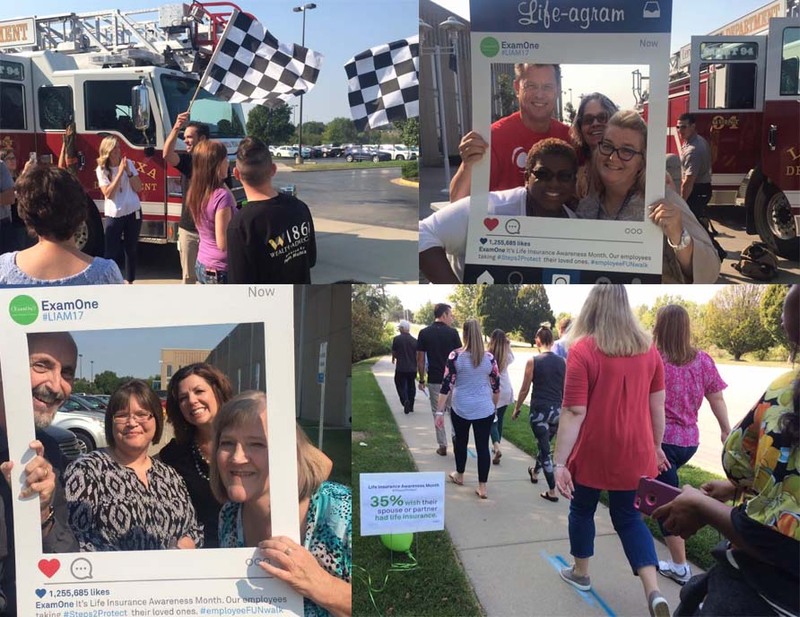 Recently, our employees stepped up to raise awareness for life insurance at our Kansas City facility during an employee “fun” walk and vendor fair. The Life Insurance Awareness Month #Steps2Protect walk gave employees a chance to partake in some healthy exercise and talk to vendors like insurance agents, the fire department and health coaches about ways to protect their loved ones. According to the 2017 Insurance Barometer study, 41% of Americans still do not have any life insurance. ExamOne is a proud supporter of Life Insurance Awareness Month and we are using this time to help change that statistic by educating individuals on the necessary steps to protect their family with life insurance. Our own employees have shared stories about how life insurance impacted their families. In addition to events like the walk in Lenexa, KS and our offices in San Diego and Lee’s Summit, MO, ExamOne is promoting life insurance with an awareness video and sponsoring a scholarship with the Life Happens foundation this year. The foundation receives hundreds of applications each year from students sharing their stories on how life insurance affected them–either through the benefit or the lack of it. Our leadership team will review a selection of candidates and choose one to receive a $5,000 college scholarship. ExamOne encourages everyone to take steps to protect their loved ones. Visit MyExamOne.com/Steps to find out other ways to protect your family and to send a friendly email reminder to someone you know that may need life insurance.